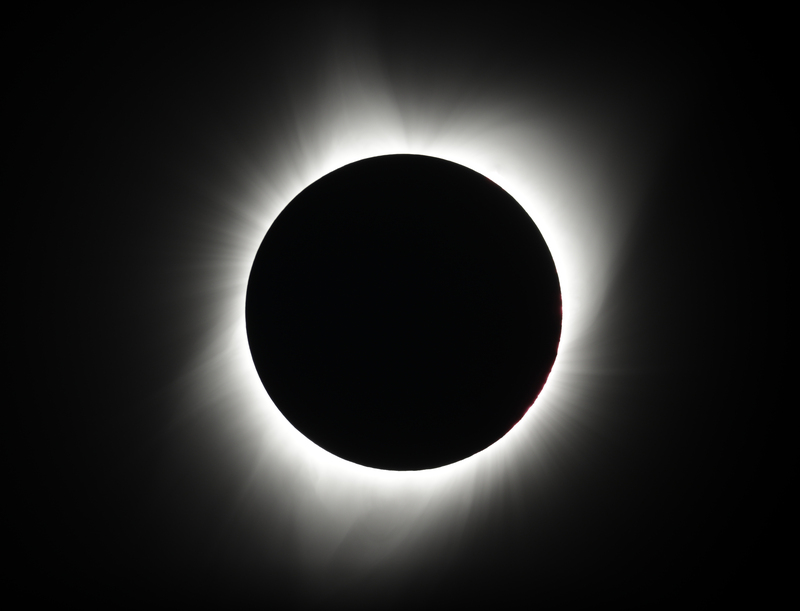 Bailey’s beads, or “the diamond ring effect” as the solar eclipse nears totality. Photo by Marilyn J. Brown. PRAIRIE CITY, Ore. (CN) – The moon’s shadow hit North America at 10:15 a.m. on Monday, bathing the Oregon coast in daytime darkness before gliding east across the nation and disappearing over the Atlantic Ocean. At 10 a.m., I stood barefoot atop a cluster of boulders deep in the Malheur National Forest watching my shadow elongate in the mid-morning twilight. My impromptu eclipse crew, a dozen strong, shared the small lava rock island in a sea of wild lilac atop a high peak. As darkness grew, an other-worldly light seemed to illuminate nearby vegetation from within. We watched, announcing the moon’s progress in front of the sun. I had planned six days backpacking alone in the Strawberry Mountain Wilderness of eastern Oregon. I didn’t know that a recent fire had drastically rerouted the Skyline Trail. On day one, I got lost when my trail disappeared into a maze of animal trails. I spent that night on a high ridge with clear views over the valleys to the east and west. I awoke at dawn and headed back to my car to refill my water bottles and regroup. But then I found my trail. And the map said there were “two welcome springs” just a few miles ahead. I was low on water, but reasoned that I could make it there, refill, and head on to my original destination: a high lake where I would swim and sunbathe for a few days before scrambling up nearby Slide Mountain on the morning of the eclipse. It was a hot day and I was thirsty. I had already been rationing liquids since the previous night. “Two welcome springs,” I chanted in my head as I carried my heavy pack over what turned out to be five miles up and back down 8,500-foot Graham Mountain. Finally I saw two vertical lines of dark green vegetation ahead. But where cold mountain water should have run, there were only thick patches of verdant moss. Water flowed here recently, but there was none now. The map said my destination – an entire lake full of clear, delicious water – was another five miles ahead. That was a shorter distance than to my car, where a gallon of water was waiting. But my map had already been wrong twice. If nothing else went wrong, I could be floating in a lake with a full water bottle in a few hours. But if I lost the trail again and had to spend another night without water, I could be in real trouble. It was a long, tough trudge to the car. I was overheated, dizzy and weak. Wherever there was shade, I stopped to tear off my boots and lie down. Each time, I had to force myself to continue. “Not far now!” was the repeated lie that got me there. The nearest town was tiny Prairie City. There, traffic was bumper-to-bumper along the few blocks of Main Street. I bought a huge bottle of Gatorade and settled in on a shaded wooden bench. There were license plates from half a dozen states and people crowding the sidewalk who were speaking Russian, German and French. Camo-encased Humvees rumbled through the town, and up and down nearby forest roads. Oregon Gov. Kate Brown had activated the National Guard to help with emergency response. The path of total eclipse ran south of Portland, so the state spent months bracing for a flood of eclipse chasers clogging rural two-lane highways during peak wildfire season. 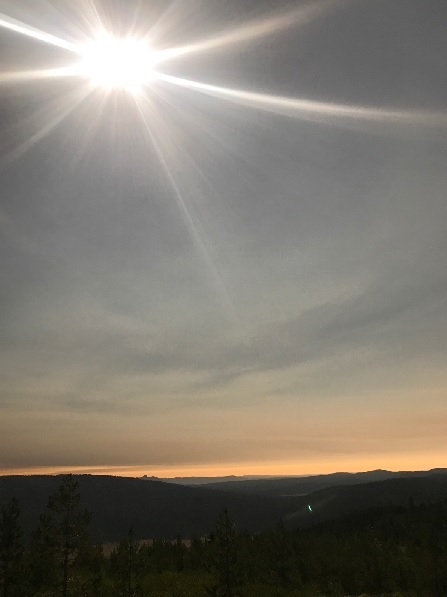 But that was before fears of coastal clouds and three wildfires shut down prime eclipse viewing areas along the Interstate 5 corridor, squeezing the estimated 1 million people flowing into the state into even more rural areas and jamming networks of two-lane roads. I bought an inflatable inner tube at the local drug store and spent the next two days in floating recuperation at a crowded, crawdad-filled lake. There, I got a closer look at the kind of crowd that travels hours or days to witness a two-minute celestial event. There was a surprisingly heavy contingent of 20-something “bros” who looked like they had traveled to eastern Oregon straight from the popular music festival in Coachella, California. The rest were equal parts young families and retirees. A group of five young men, students at UCLA, said they had driven through the previous night to be here. What had inspired such a trip? “We just really love nature,” one said to the vigorous nods of the others. So they must do quite a bit of camping and hiking? No. This was their first time in the woods. Outside of a car, they were quick to add. Improvised camps dotted the forest roads surrounding Prairie City and in nearby Malheur National Forest. One camp flew a purple tapestry that looked like a prize from a 1980s carnival. On it, a wolf on a mountain howled at the moon – a scene that crew drunkenly enacted each night. The night before the eclipse, I set out again for the high ridge I had stumbled on during my first day. This time, I lugged two gallons of water up the steep trail. I camped alone, but somehow by morning a perfect little eclipse-viewing party had assembled. Two young families, an older couple and me. No one knew each other before our series of chance meetings on the trail the day before. But as we hiked to the top of a nearby peak, excitement added an extra dose of warmth and openness to the usual get-to-know-you chatter. 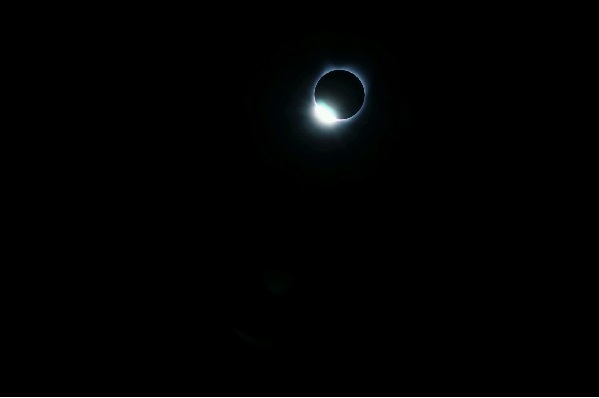 At the top, we passed around viewing glasses and shared blankets in the sudden cold of the nearing total eclipse. Then, in the most beautiful twilight, the truth of the seemingly endless blue sky was revealed to be a glowing dome, its edges illuminating the horizon in all directions. There it was: the black hole hanging in the eastern sky, encircled by a dancing ring of light. Solar flares shot out at three points, making an upside-down triangle around the sun. Somewhere nearby, coyotes howled their maniacal laughter, like they were in on some lunar inside joke. Among my companions, there were a range of reactions. Baby Warren slept through totality, while 8-year-old Jasper spent the entire minute and a half whooping. But mostly, my eclipse crew repeated awed exclamations. “Wow. Wow. Wow,” one said. “This is amazing,” another kept saying. Marsha, a 53-year-old administrator for Caltrans, said later that she wished everyone in the country could have seen it. “Then there would be no more arguing over whether science is real,” she said. We made our way back down the hill, under the light of a crescent sun. Occasionally someone would put on their viewing glasses and look up. “It’s still there,” they would say. But no one really seemed to care about the partial eclipse that had so captivated us just an hour earlier. Now, nothing could compare to that magnificent twilight.